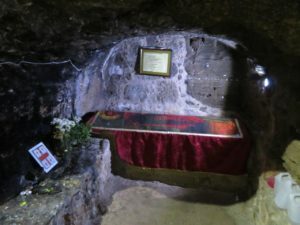 Saint Barnabas’ grave lies on the northern (Turkish) side of Cyprus, in the cellar under a small chapel. 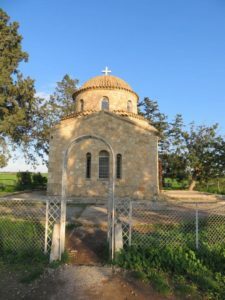 Although this saint’s grave is a major ‘asset’ for the status of the Cypriot-Orthodox church, no signs of love or care can be found. I expected to find a place with worship and deep veneration but the grave of Saint Barnabas bears hardly any signs of that. 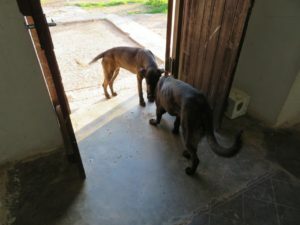 To my surprise, street dogs were walking in and out of the chapel. The grave cellar contains just a few cheep pictures and a candle here and there. 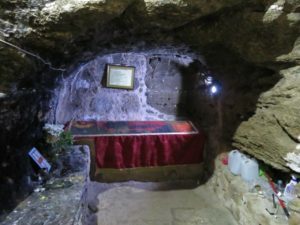 Whoever saw the decorations and worshipping around the graves of for example Saint Peter, Saint Paul and Saint John can not believe his eyes in seeing the treatment of Saint Barnabas’ grave. Saint Barnabas was an apostle who worked a lot with Saint Paul. He was the one who introduced Saint Paul who was converted only after having persecuted the Christians, to the apostles who still feared that man. Barnabas convinced them that Saint Paul’s conversion was truthful. Saint Paul and Barnabas traveled together from Antioch to Tarsus to Jerusalem, from Cyprus to Pamphilia. The couple spread early christianity every where, until they fell out and split. After that both went their own way. In 46 AD Saint Barnabas returned to the city of Salamis in Cyprus, the Island where he was born. The Bible does not mention what happened to him after that but Christian tradition dating from the 3rd century already has it that he died as a martyr there in Salamis (c. 75 AD). 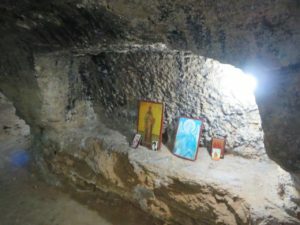 His remains are buried in a small grave cellar under a chapel not far from that ancient city on the northern side of Cyprus. As said the chapel is open for everybody, even dogs. The interior contains nothing special. 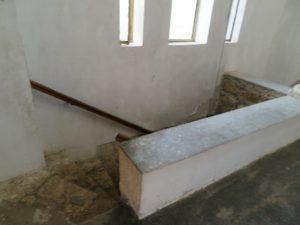 Just take the stairs to go down and see the coffin in the cellar. The fact that Cyprus ‘has’ Saint Barnabas is the main reason that the Cypriot-Orthodox church is an ‘independent’ church. 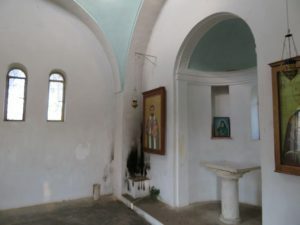 Unlike what many people think, they do not belong to the Greek-Orthodox or similar orthodox churches. Of course they do have strong ties but the Cypriot-Orthodox church makes it’s own policies, can go it’s own way. This was particularly clear in the ’60s and ’70s when archbishop Makarios was president of Cyprus. Religion and politics intertwined and there was no way to stop Makarios in his policies to let Cyprus become one with Greece (‘enosis‘) and oppress the Turkish-Cypriot community. 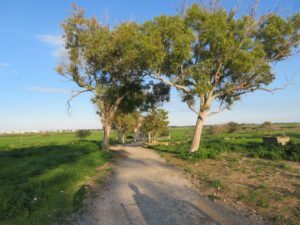 During 30 years it was not possible for Greek Cypriots to go to the North and for Turkish Cypriots to go to the South but there is again free access already since 2003. You’d expect an investment by Greek Cypriots to make Saint Barnabas’ grave a respectable place of veneration. Or have they gone beyond the point where that matters – how proud are the Greek Cypriots of a church that is still a major factor in blocking peace processes in north-south negotiations? Anyway, I found it painful to see the status of Saint Barnabas’ grave. Whatever today’s politics are like, he lived in a different turbulent period and did his upmost to create something new and good he believed in. He suffered for that and deserves a better memorial. 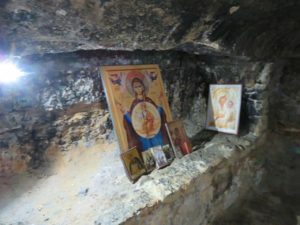 Saint Barnabas Icon and Archaeological Museum: the former Saint Barnabas Monastery where the last monks left in 1977. Royal Tombs like Homer’s Iliad: not just the Royals Tombs but also the Cellarga necropolis lies here. Some graves excavated next to Saint Barnabas’ chapel seem to be part of that necropolis.